Couples spend lakhs and in some case crores of rupees for planning the most mind-boggling wedding functions. They hire grand wedding venues, setup eye-catching wedding decor and what not! But a wedding is always remembered for its food. Yes, no matter how much money you may have spent on planning the ceremony, if food is not able to meet the guests’ expectations then your wedding will be remembered forever for the wonderful arrangement but tasteless food. Would you like that? The answer is obviously a big fat NO! So what to do then? 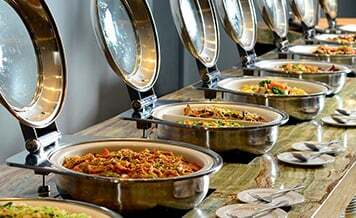 How to ensure that only the best wedding catering services in Ahmedabad are booked for the ceremony? Well, if you ask us then it all comes down to the planning and preparation done by the couple for searching and booking the ideal event caterer. To help you out, we have compiled a list of 9 tips which will ensure that you pick only the best vendor and make the wedding memorable for all the guests. Responsiveness And Personal Interest In Your Requirements: Listening to customer requirements is considered to be the most important quality of a professional wedding caterer. 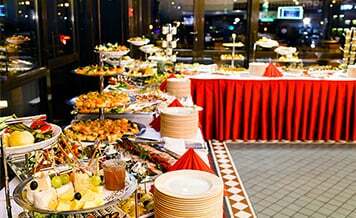 Often caterers keep on ranting about the best quality of food or menu or services by them in the city. And due to this they never listen to the actual needs of the couple who are getting married. The best way to know if the vendor is actually interested in the wedding are the questions regarding the wedding theme, venue, preferences etc. Hence you should hire a caterer who listens to your requirements and then provides his expert inputs based on your needs. Sample The Caterer’s Food: One of the best ways to get an idea about the food quality and service of the caterer is by sampling his/ her food. 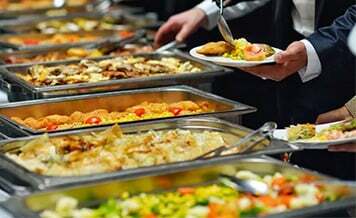 You can either ask the caterer to serve sample portions or visit any event which is been catered by the vendor. This tasting session will also help you give any kind of feedback to the chef which can be used to adjust the menu items for your event. It will also give you an idea about the food presentation skills of the caterer and chef. Ability To Handle Wedding Ceremonies: It is a very well known fact which is even admitted by many vendors that not all food caterers are expert in handling every event. There are some caterers who specialize in handling corporate parties while there are some who have expertise in handling wedding ceremonies. For example, in case of wedding ceremonies, the caterers are often faced with last-minute requests from the clients as compared to corporate events which are planned to the T. Therefore you should hire only from the list of top wedding caterers in Ahmedabad. Ask For References: If you know a close family member or friend who recently got married, then ask for their suggestions about different food caterers. This will save a lot of your time which would’ve been wasted in searching the market and shortlisting the best food caterer from the list. 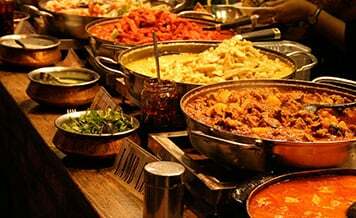 Multiple Cuisine Options: Weddings in India are not limited to 100-200 like the western ones. Here the guest list easily touches a count of one thousand. This means that the wedding menu should include different food/ cuisine options which can please guests of different ages. Like Italian cuisine is loved by kids and young adults while North-Indian food is a favorite of adults. Hence the wedding caterer should have trained chefs who can cook multiple cuisines which should taste finger licking good. Venue Restrictions, If Any: Before booking any wedding caterer in Ahmedabad, you should consult with the wedding venue owner regarding any sort of restrictions on catering vendors. 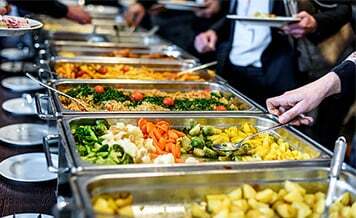 There are certain venues who tie-up with a particular food caterer and this place restriction on the couple to opt for their food service to host wedding at that venue. In order to hire an outside caterer, you may need to pay a waiver fee which is in addition to the venue rent. Therefore, to secure your interest consult with the venue owner before booking any wedding caterer. Availability Of The Staff: To serve food at weddings, multiple servers are required. Like for roaming around the venue with starters, shakes, drinks, and soups. Ask the caterer whether he will provide you with servers as well or you will have to make separate arrangements for the same? We recommend opting for a caterer who is willing to provide his own staff as this will reduce the workload on you to search and hire another vendor. Customer Feedbacks: Even if you are hiring from the best wedding catering services in Ahmedabad, it is recommended to seek out previous customer feedbacks. This exercise will give you a genuine insight into the food quality and work ethic of the vendor as well as his team members. Cost: Last but one of the most important tips is regarding the cost. Before you start searching for different vendors, we recommend fixing the amount of money you can easily spend on hiring an event caterer. This will help to keep in check any kind of overspending which is a problem often faced by couples. So these are our nine magical tips which will help you capture only the best and most professional wedding caterer. Now, the next step is to find different catering vendors which are available in the market. There are three ways for searching such vendors, you can either ask for referrals from friends and relatives or roam around the market or take a smart shortcut! The smart shortcut is called Shaadidukaan.com which is India’s leading online wedding market. Here you will find more than thirty thousand wedding vendors who are registered online on the website. Not only wedding caterers, here you can find and book the wedding venue, Dhol Wala, Mehndi artist, bridal and groom wear shops and much more. This portal can easily be said to be your one-stop wedding destination.